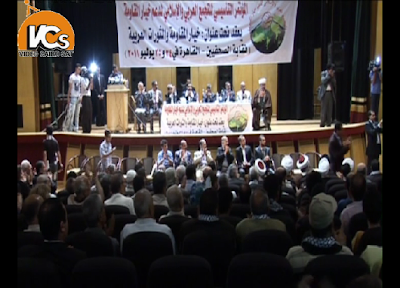 On July 24-25 Egypt hosted a conference called the “Founding Conference of the Arab-Islamic Gathering to Support the Option of Resistance” [i.e., terrorism] to support the so-called “resistance” (i.e., terrorism and violence). It was held at the Egyptian Press Syndicate in Cairo. The Palestinian media reported that the conference was attended by representatives from 14 Islamic countries, among them Saudi Arabia, Tunisia, Turkey, Iran, Indonesia, Morocco, Sudan and Jordan. Also present were representatives from the Muslim Brotherhood and other Egyptian political establishment elements. In addition, there were representatives from Hezbollah, and Hamas and other Palestinian terrorist organizations. The Hezbollah representative gave a speech in the name of Hezbollah leader Hassan Nasrallah (Qudspress and Ma’an News Agency, July 24, 2011). The conference attendees attempted to establish a link between the so-called “resistance” (i.e., the path of terrorism) and the popular protests in the Arab countries in recent months, stressing that the “resistance” was the only option for “liberating” Palestine. Osama Hamdan, responsible for Hamas’ international relations, said in a speech that “the [Israeli-Palestinian] conflict will never end unless Israel ceased to exist,” and that Hamas would never recognize Israel (Al-Quds TV, July 24, 2011). “Symposium on religious harmony” in Jordan. Only two religions, though.